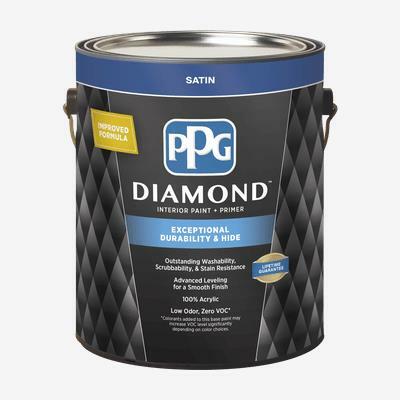 The improved DIAMOND™ Interior 100% Acrylic Paint + Primer provides exceptional durability and hide and outstanding stain resistance that protects and beautifies any room in your home. All backed by a Lifetime Guarantee. Colorants added to this base paint may increase VOC level significantly depending on color choice. COVERAGE: Approximately 300-400 sq. ft. (27.9-37.2 sq. meters) per U.S. Gallon (3.78L) on smooth, nonporous surfaces.